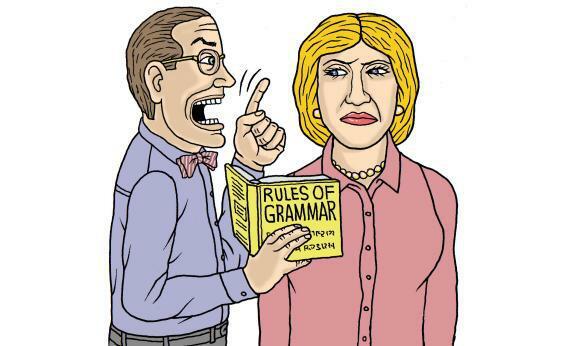 Language bullies, pedants, and grammar nerds who correct people all the time: Cut it out. Are You a Language Bully? Can you recite the dictionary definition of peruse from memory? Do you have the etymology of short-lived stored in the recesses of your brain, available at a moment’s notice for impromptu punctuation lesson purposes? Are you an expert on the difference between rebut and refute? If you answered “yes” to all of these questions, then you may just be a language bully. You may not be one, though. So don’t panic. Here’s the best way to know for certain: Do you annoy and infuriate people at dinner parties and other social gatherings by correcting others on how they use or pronounce certain words? That’s the key hallmark, because there’s certainly nothing wrong with simply knowing things about words that the average person does not. It’s great if you’ve built up lots of esoteric language knowledge and proceed through life as an intelligent person who is interesting, and humble, and fun to be around during trivia nights at the bar—a loveable know-it-all, in other words. But no one loves a know-it-all who doubles as a showoff. Who among us hasn’t bristled over Alex Trebek harshly judging Jeopardy! contestants for their incorrect answers? And who doesn’t smile broadly as Rodney Dangerfield’s Thornton Melon outwits the stuffy, bow-tied business professor during the climactic final examination scene in Back to School? Before considering why these individuals do what they do, it’s probably best to differentiate the contemporary language bully from other people who go around correcting us. That old-timey co-worker who informs you that “ain’t ain’t a word,” for instance, is not a language bully. He’s just annoying. The same goes for there/their error-pointer-outers and those who get worked up about when it’s OK to use the word literally. These elementary language kerfuffles deal with a particular type of displacement from the norm: For the most part, we all know the appropriate rules in those instances, but sometimes we slip up anyway—or we just don’t always care about getting those things right. Such uncomplicated lapses aren’t usually fodder for language bullies, who own important books and roll in more rarified, detail-oriented correction circles. They specialize in applying real or imagined upper-level knowledge to best ensure maximum kingmaking impact. For some examples look no further than any space where those who have read, watched, or listened to something can provide feedback. Comments sections, for instance, are to language bullies what the Cheers bar was to Norm Peterson, or what murky waters at twilight are to the bull shark. These response repositories are where we are implored to learn that peruse doesn’t really mean to skim over something leisurely, and where we discover that some guy with the handle funkymonkey23 would love it if, “just one time,” a writer would not misuse the word tithe. Let’s put aside every other question we might have about that tweet, and consider, simply, why someone would write such a thing. But to take full advantage of that knowledge, language bullies must use it in a way that allows others to recognize and appreciate their possession of this advanced understanding. So the excitement they derive from publicly correcting someone does not end when the offending party is set straight. In some ways language bullies are putting on a show for other persnickety peevers. That’s not to suggest, of course, that all who offer up hyper-technical corrections in a public forum are necessarily language bully-type enemies. (Monin posits that some correctors may earnestly consider themselves stewards of the language: “If people misuse a word repeatedly, that becomes the usage of the word. So in that respect, it’s important to [speak up] if I think the ‘correct’ usage is important.”) But even if we assume altruistic motives in every case, that doesn’t make pushy, nitpicky language corrections any easier to stomach. Fortunately, Jeff’s anti-awesome bullying was not the last word on this issue. In a triumph of good sense, his insight received no love, and zero likes, from fellow commenters. Instead, it got what it deserved. “You must be a hit at parties,” a follow-up commenter replied concisely, awesomely. Twelve people gave that one the thumbs up.